In expanding the Fangbait series, we will be releasing the DR series in “SW Limited” version to further its penetration into saltwater market. The deep divers will be used especially for trolling purposes(tested for up to 8 knots), so to enhance its appeal, the Fangbait DR SW Limited models will also be equipped with rattle sound. As a pioneering model for Fang Ops brand, it represents the concept of building some of the toughest lures in the world to the fullest. The tag team of 120DR and 140DR has been built to tackle even the largest of the “beasts” guarded by a strong 1.2mm diameter thick wire running through the whole body. By running the wire through the outer side of the body, we were able to further reduce the plastic usually required around the wire, while increasing the air chamber for more buoyancy. We have also inserted 3 different sized stainless-steel pins to secure the wire which runs through the body. This prevents the wire from coming loose, while reducing the weight by trimming the unnecessary meat off the body. 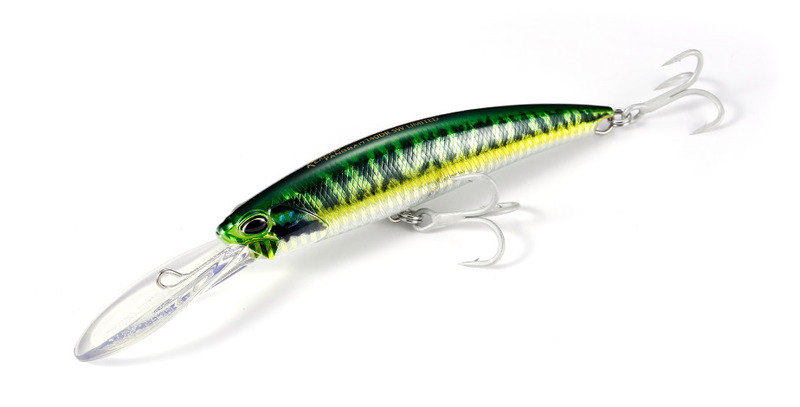 The next generation diving jerkbait, Fangbait DR series will change the conception of what was known as a diving type lure.